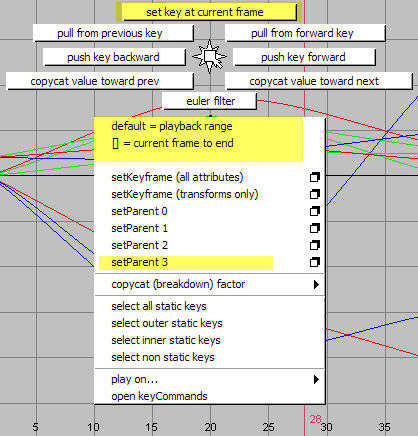 Use it to nudge keyframes forwards and backwards and to scale animation curve values relative to a selection of pivot points. What is really cool is the "curve pivot" mode. 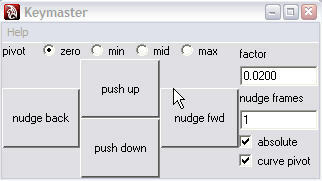 For example you can specify the pivot to be "max" and activate "curve pivot". When you "push up" or "push down" the curves are each scaled relative to their own maximum value. The "absolute" flag plays an important roll in how the scaling works. Setting the "absolute" flag means the keyframe value is always decreased when pushing down and increased when pushing up. If "absolute" is NOT set, then "push down" means scale the keys to be closer to the value of the pivot. This can be a little confusing until you see it in the graph editor, but essentially it means that a keyframe whose value is less than that of the pivot will increase in value (moving it closer to the pivot value) if you "push down". This is a marking menu that can be created from the zooToolboxUI. To take full advantage of this wonderful menu you need to use weighted tangents with unlocked weights. You can then use it to sharpen/unsharpen or tighten/untighten tangents in increments, which is much less trouble that manipulating the tangent handles directly. But the best function of all is "make sensible tangents". 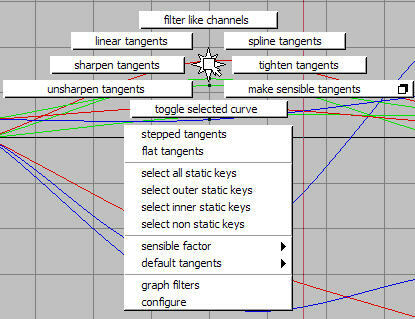 "make sensible tangents" pulls your animation curves into shape by minimising the exagerated over-shoot that often results from spline tangents, but it avoids the jerky feel of using linear tangents. You specify a "sensible factor" so the curve reshaping is incremental. When the marking menu is assigned to a key, holding that key and left-mouse-click brings up the menu, but tapping the key once, with no mouse click does a "make sensible tangents".Â Â So it becomes a simple matter to iron out those kinks with a few key taps.